View of Glen Valley farmland, the Fraser River, and Coquitlam/Burnaby Mountain from Bradner Road in Abbotsford, British Columbia, Canada. This view of Glen Valley’s farmland is one that I had forgotten about for many years. I remember looking out the car window and seeing this view as a kid from the backseat of my parents’ car. 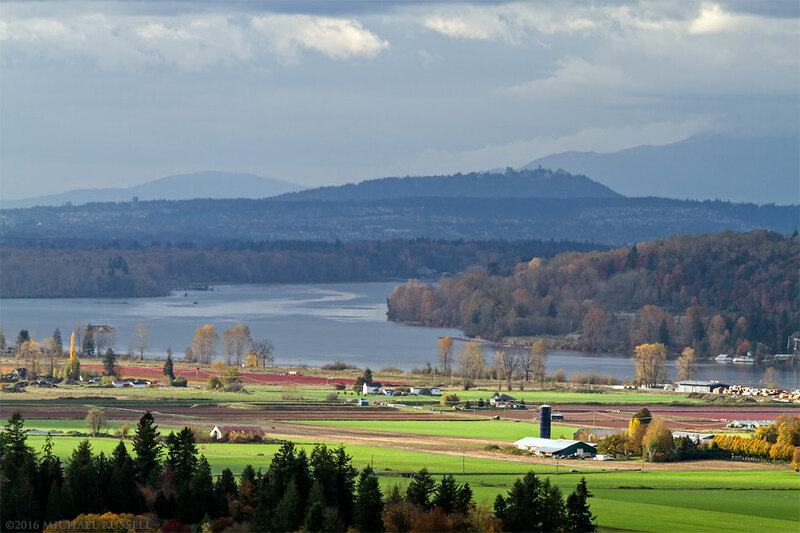 On a rare, non rainy day last fall I remembered the viewpoint when I was nearby, and decided to drive up to Bradner Road to see if it was still there. I was happy to find it hadn’t been overgrown by trees and still offered good views of Glen Valley below. It wasn’t the clearest day but I think I will be back there in the spring to see if sunset offers any interesting light from this vantage point. One of the common crops farmed in Glen Valley are cranberries and blueberries. The bottom left of the above photograph shows one of the many partially flooded cranberry field after harvest. The fields are flooded in the fall so that the berries float to the surface (after a bit of a beating) for easy collection. The third photo here shows Glen Valley, The Fraser River, Macmillan Island, Coquitlam, and Burnaby Mountain beyond. I was a bit surprised how far I could see from this elevation. The top of the Port Mann Bridge and many taller buildings in Surrey were also visible. For more photos of Glen Valley and the surrounding region please visit my Fraser Valley Gallery. 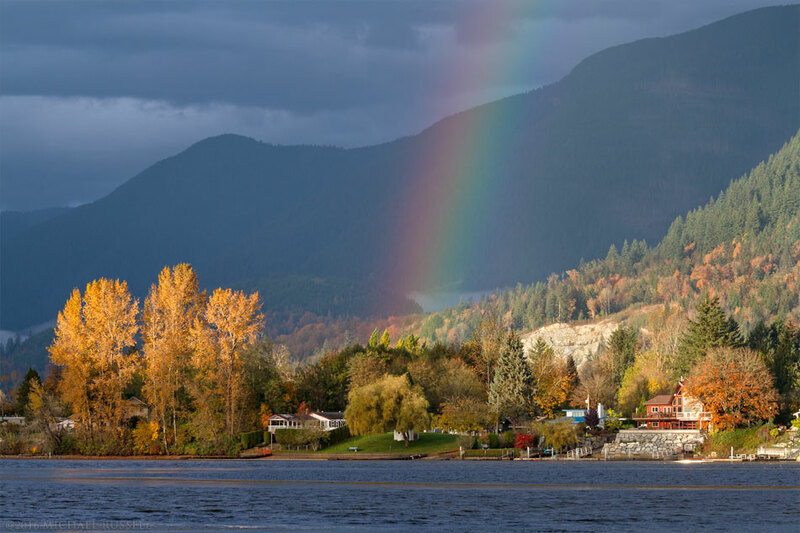 A rainbow over Hatzic Lake and Hatzic Island near Mission, British Columbia, Canada. Photographed from Neilson Regional Park in Mission. This fall has been really wet. This October we’ve had 28 days with rain (26 was the old record) – the dreariest on record. While it is “only” the 12th wettest by volume, the frequency has made it difficult to photograph what fall foliage colours there are out there right now. This year doesn’t appear to have been an overall great year for color in the Fraser Valley anyway. 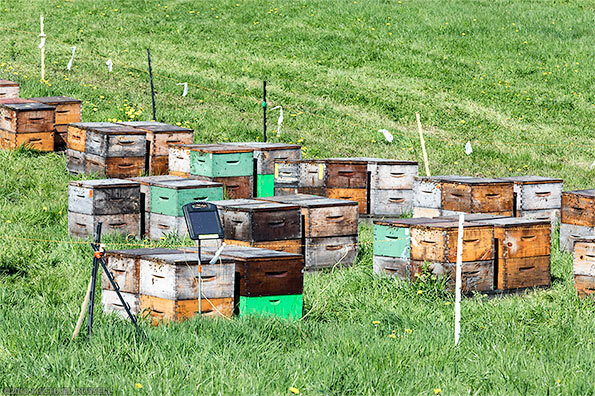 Just as with photographing wildflowers, however, it just takes one good spot – you don’t need a whole forest. So even when the conditions aren’t great or the fall foliage is more of a rotten brown colour, it is always worth it to get out and look for individual trees/shrubs with a better display. 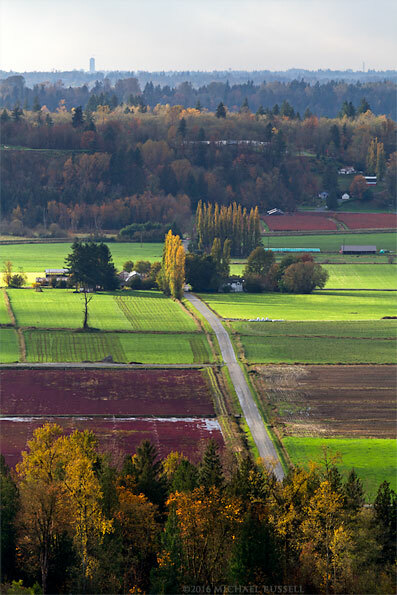 On Tuesday I drove through the farmland in the northern part of Abbotsford to see if I could find some new farm scenes with fall foliage. I found a few new locations, but one I had been planning to shoot was a movie set on that day. This blocked me from trying to shoot there – the movie set people don’t exactly like people hanging around with a camera and tripod! I eventually crossed over the Abbotsford-Mission Bridge and found my way to Neilson Regional Park in Mission. I haven’t been to this park in probably 25 years, so I was curious if anything would feel familiar about it. I recalled walking down to the shoreline with my parents and seeing schools of carp (or a similar species) near the shore. On Tuesday I found only a brief rainstorm (and no fish), but some direct sunlight gave me the opportunity to photograph this rainbow in rather scenic surroundings. Hatzic Lake is in the foreground here, and some of the fall foliage on Hatzic Island provided some nice colours. The mountain in the background is Mcnab Peak (I believe). I think this is the first rainbow I have photographed while not standing in my backyard. I’ve seen many, but often not in a photogenic location. Happy to have been at Hatzic Lake for the 10 or so minutes this one was in view! 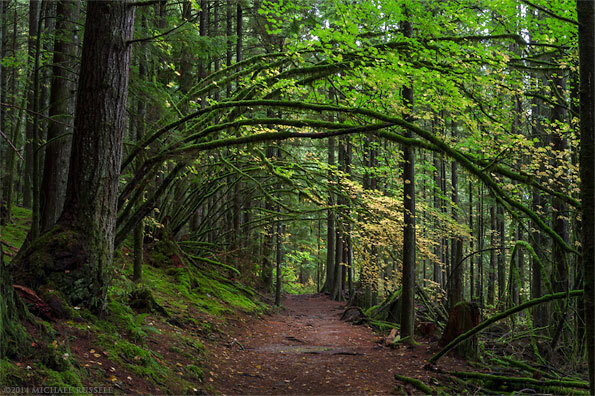 For more of my photographs of this area visit my Fraser Valley Gallery. 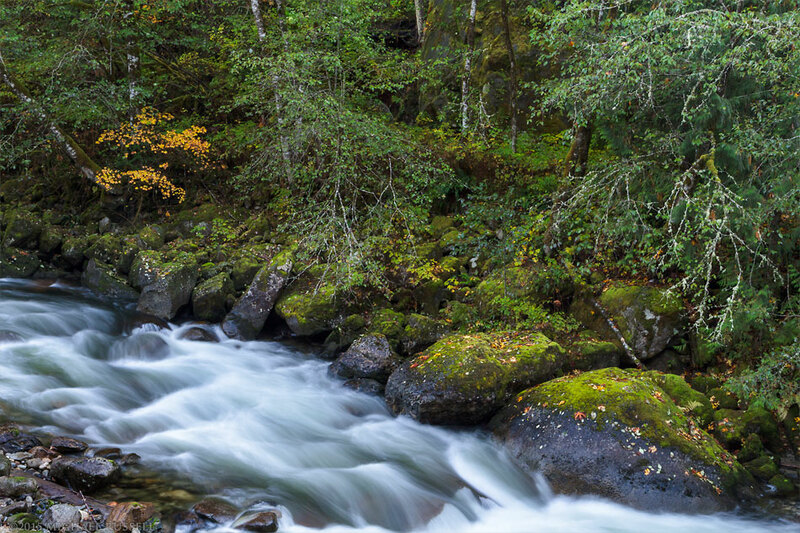 Fall foliage colours along Silverhope Creek near Hope, British Columbia, Canada. Having just written a post about great fall colour at Whatcom Falls, here is one trip where colour was a bit more of a challenge to find. Fall is one of my favourite times to photograph but finding good fall colour in the Fraser Valley can be difficult depending on the year. In the fall of 2015 colour was hard to find, as it was when these photographs were made – back in 2011. However, as I’ve probably said here before in terms of fall colours (and wildflowers) you often just need one to make a scene work. 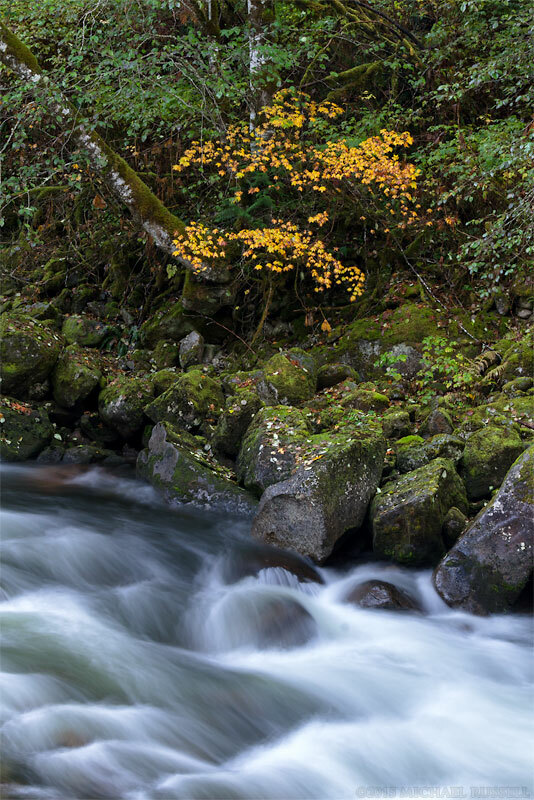 These photographs show just one Vine Maple (Acer circinatum along Silverhope Creek in Hope, BC. 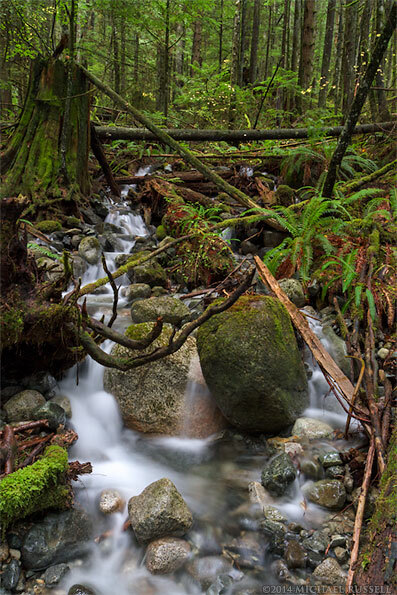 This is one of several good spots for photography along Silverhope Creek on the way to Silver Lake Provincial Park. For more photographs of this region please visit my Fraser Valley Gallery. I tend to consider this list more of a top 10 favourite photographs of 2014 than the “best”. Choosing the images for my Nature Calendars always helps me narrow these things down a bit ahead of making my final list below. Once again, I am making this post so I can be a part of Jim Goldstein’s annual Your Best Photos project. Look for his post early in the new year with all the entries from a wide variety of photographers. Always a great place to find new photographers and their work. Rolley Lake Provincial Park in Misson, British Columbia is a place I started exploring again last fall having visited it many times as a kid. Last year I was able to find some fall colours in individual trees and went back again last week to hopefully find the same. This is not Eastern Canada, so we don’t have the large deciduous forests that provide great fall foliage displays. Usually we have to rely on Bigleaf Maples (Acer macrophylum) and Vine Maples (Acer circinatum) for our fall colours in the Fraser Valley, and they don’t always show very well. This year appears to be one of those years where environmental conditions dictated a turn from green to orange/brown rather than a wide array of reds, oranges and yellows. Still, even in a bad year for fall foliage all you need is to find one tree in a photogenic place. The Vine Maple trees were hanging over this spot along the Rolley Lake Trail on the north side of the lake. You can see one is a nice yellow colour, while just a few feet away its cohort is still perfectly green. Further along the trail you run into a small bridge crossing a creek (that I believe is unnamed) running into the north west side of the lake. Just upstream from the bridge (I did some exploring) I found this tree that had fallen over the creek and was now home to a lot of mosses and some fern species. A textbook definition of a nurse log if you remember that from science class. On the western side of the lake there is a marshy area filled with a lot of low shrubs (especially Spirea) and this bridge spanning one of the small streams that drain through into the lake. While these shrubs were not exactly showing off a nice fall colour display, I did like their reflection on the lake with the background forest and mist higher up the hillside. 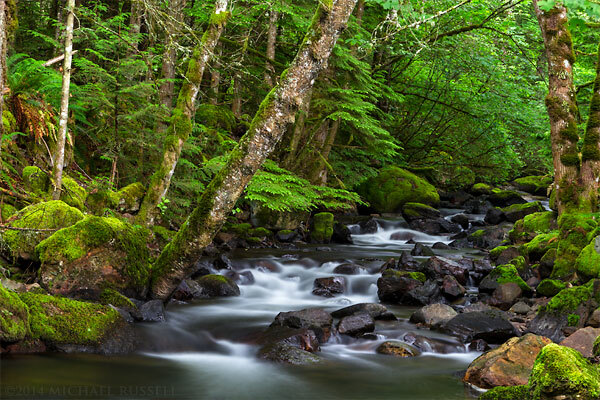 This is one of the two main creeks (also unnamed I believe) that run into Rolley Lake along the north side. I followed this one up the hill for a ways and found this spot that had a few nice, mini waterfalls and mosses and ferns. 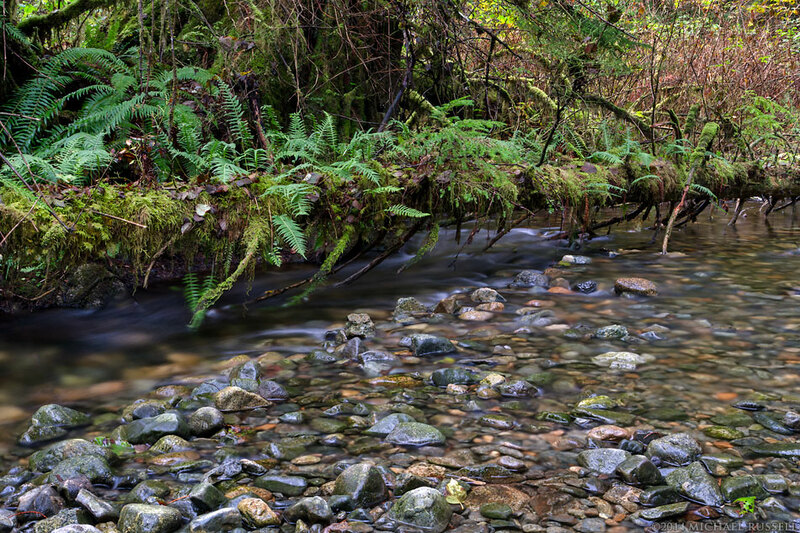 You can tell in times of higher water that this creek can carry some power – as shown by all the boulders, stumps and other debris in the creek. Not a neat and tidy area, but I thought I’d show the randomness of nature with this one. 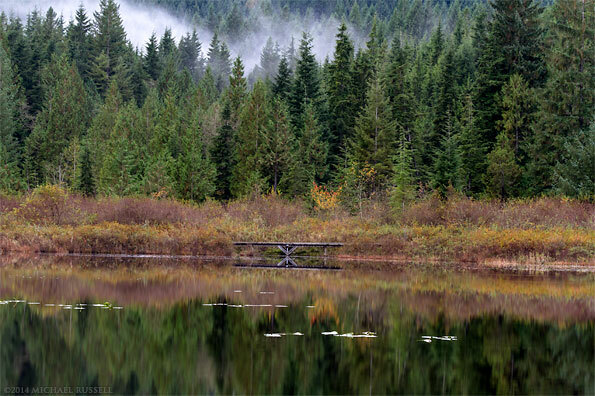 You can see more of my Rolley Lake photography in the Rolley Lake Provincial Park Gallery in my Image Archive. 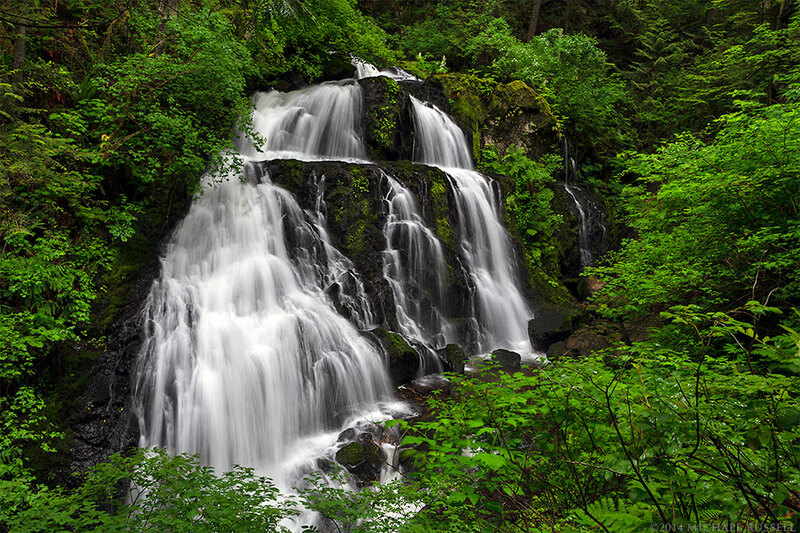 Yesterday I headed to Steelhead Falls in Mission, British Columbia. I had previously attempted to find this waterfall but the main parking lot was closed, and when accessing the trail I went the wrong way (there were no signs) and was disappointed. Starting from the parking lot yesterday the falls were pretty easy to find after a short hike (in the correct direction) to Steelhead Creek. This is a great falls to photograph – there are many tiers and cascades that have a wide variety of angles of approach so the options are plentiful for photography. I was lucky to have the cloud cover hold as the forecast was for afternoon clearing. 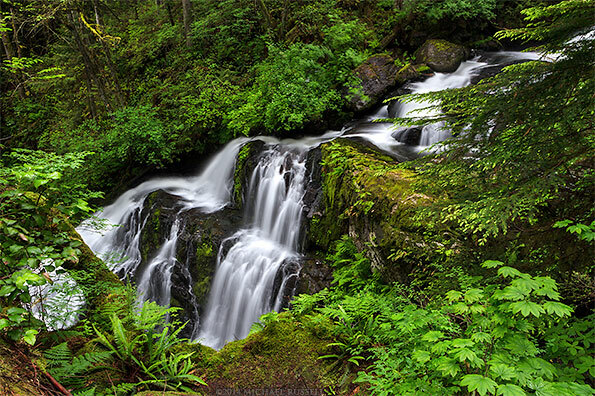 Photographing waterfalls in the sunshine is usually a nightmare so I prefer to head out on overcast days for even lighting and cooler temperatures for hiking. While loading up in the parking lot on the way in, there was a lot of strange vocalizations by the Ravens (Corvus corax) in the trees overhead. I had initially thought some of the noises may have been an owl, but later saw a Raven making the same noises that sort of sounded like blowing on the open end of a bottle. Either way, it was a really creepy (though interesting) way to start a solo hike with nobody else around.